Our friends Capteain Sabin Basnet and Mr. Purna Awale of Fishtail Air were killed in Helicopter accident on 7th of November during the rescue mission to Mt. Ama Dablam, wrote our friend Lhakpa Gyalzen Sherpa today. He went to Lukla to organise this evacuation with medical team. 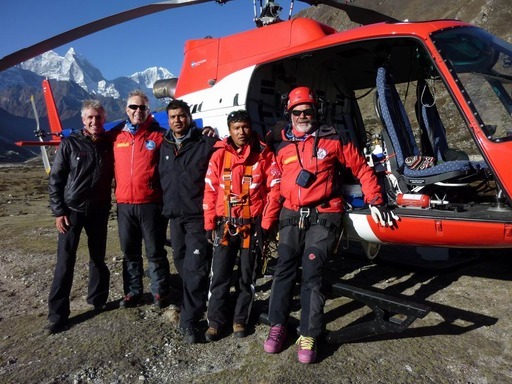 6 Sherpas to retrive their body from 6000 meter to 5000 meter then by Helicopter lifted to Kathmandu yesterday. The accident was happened during the rescue one German and one Japnaese who were descending problem on North Ridge. The German was already evacuated and it was happend in 2nd attempt to evacuate the Japanese. Yesterday early morning, fishtail air Captain Ashish Sherchan and Siddhartha Gurung had successfuly evacuated the Japanese as well. The cause of accident might be windy and tail rotter touch the mountain and rolled down the helicopter about 1 km from 6300m. We are in our thoughts and prayers with the wifes, children and the families of our friends Sabin and Purna and wish a lot of strength for this difficult time. Successful collaporation between Air Zermatt, Fishtail and TOPtoTOP for the recovery of two bodys on Everest mid May 2010. Capteain Sabin Basnet and Mr. Purna Awale 3rd and 4th from the left.